The fastest car in the world for 2015 has to be Lewis Hamilton’s Mercedes F1 car but since no one except Hamilton and Rosberg get to drive the Mercedes F1 W06 Hybrid, we’ve restricted our search for the fastest car in the world for 2015 to those that go on the road. The Koenigsegg is the third fastest car on the planet but you’re still looking at a machine that’s capable of 260MPH and a 2.9 second 0 to 60MPH time. Its 1,099BHP isn’t far off the amount pumped out by the next car on our list but you’ll only need to have $1.6 million to get yourself into this monster machine. This is the second fastest car on the planet. It’s top speed of 268MPH is just 2MPH slower than the last and fastest car on our list. With 1,200BHP and a $2.4 million price tag, this is seriously top end motoring. While Ferraris are bought by company owners and footballers, this type of car is brought by rulers of oil rich states. In the game of one-upmanship played by drivers around the world, this is bought by those who want to put their neighbour’s 253MPH, $1.7 million base-spec Bugatti Veyron in the shade. As you’ll see from our lead image, the Hennessey Venom GT looks a lot like the Lotus Elise from which is takes its chassis, but looks are deceiving. 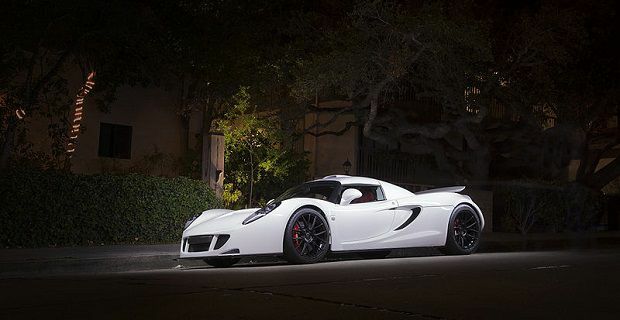 This is no underpowered lightweight sports car like those made by the British marque, the Hennessey Venom GT is a seriously fast car. If you’re not blown away by the 270MPH top speed, perhaps the 2.5 seconds to 60MPH time will impress you, or maybe it’s the $1 million price tag that allows you to understand that you don’t need a Ferrari, Lamborghini or McLaren nameplate to have an extremely fast road car.